On 30 September 2016, ESA's Rosetta spacecraft came closer than ever to the target it had studied from afar for more than two years, concluding its mission with a controlled impact onto the surface of Comet 67P/Churyumov-Gerasimenko (67P/C-G). This second comet landing followed the pioneering endeavour of Rosetta's lander, Philae, which became the first probe to successfully touch down on a comet on 12 November 2014. Seen in the centre and left of the frame is Seth, one of the geological regions on the larger of the two comet lobes, which declines towards the smoother Hapi region on the comet's 'neck' that connects the two lobes. The landscape in the background reveals hints of the Babi and Aker regions, both located on the large lobe of 67P/C-G. For a wider image of this region in the overall context of the comet see here. The sharp profile in the lower part of the image shows the Aswan cliff, a 134 m-high scarp separating the Seth and Hapi regions. 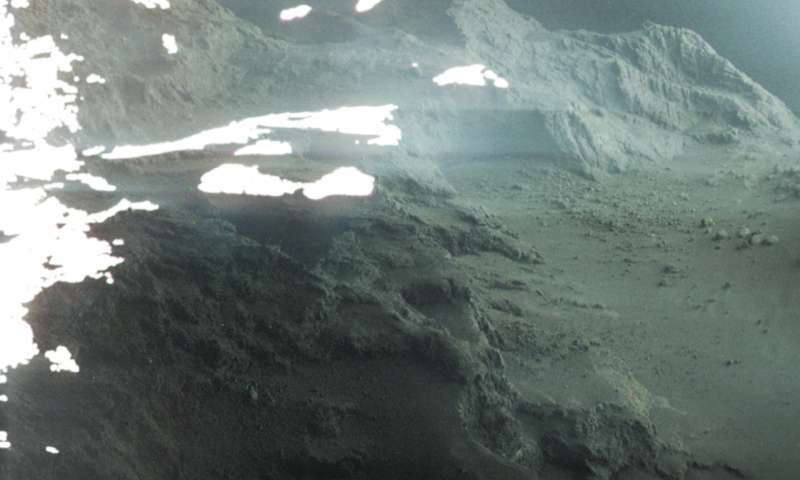 Observations performed by Rosetta not long before the comet's perihelion, which took place on 13 August 2015, revealed that a chunk of this cliff had collapsed – a consequence of increased activity as the comet drew closer to the sun along its orbit. And not a single thunderous lightning bolt in sight? Maybe the cometary godling is shy? Or, as usual, passed out drunk! Yep, and not a blip on the magnetometer in 2+ years! Nor interference to the radio signals. Nor a hint of rock. Nowhere to be seen. You'd have to be really dumb to believe in Thornhill's woo. However, there are demonstrably people who are that dumb!